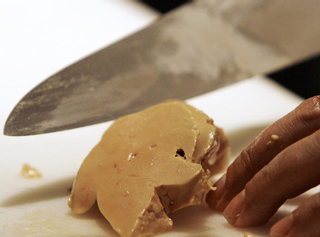 Any way you slice it, foie gras — the fatty liver of a duck or goose — is a fighting matter. To animal rights activists it is quite obviously cruel and depraved. To many chefs and eaters, it is a delicious extravagance. To many other chefs and eaters, it is something they would rather not countenance. To the vast majority of French people, it is a symbol of their nation and an essential part of their identity, the rare product of smiling rustic grandmothers, making a bit of pin money on the side. And for the industrial producers responsible for 90% of French foie gras, those rustic grandmothers are icons of perfect marketing. The whole foie gras story — which is by no means over yet — offers a fascinating insight into the role of politics in food — which happens to be the subtitle of a new book by Michaela DeSoucey, a sociologist who got caught up in foie gras just before the topic exploded all over the food scene in Chicago. In this episode, we talked about just a few of the things that make foie gras such a special topic. Michaela DeSoucey’s book is Contested Tastes: foie gras and the politics of food, published by Princeton University Press. There has been an awful lot written about foie gras in America, more than I care to link to here. But the Chicago Tribune did publish a look back at what they called Chicago’s foie gras fiasco. I took the cover photo from there. If you want some straight talk on foie gras, and how to prepare it from scratch, you could do worse than visit Peter Hertzmann’s website. Banner photo of Chef Doug Richey (c) Heather Irwin. And the music? Sonata IV in C Major for Trumpet and Strings by Heinrich Ignaz Franz von Biber. Nino Bariola liked this on twitter.com. Foie gras offers a fascinating insight into the role of politics in food — which happens to be the subtitle of a new book by Michaela DeSoucey, a sociologist who got caught up in foie gras just before the topic exploded all over the food scene in Chicago.